Endowed with a versatile application scope, bleaching agent market has emerged as one of the most lucrative spheres in bulk and specialty chemicals industry. Bleaching agent have been extensively used across wastewater treatment plants, textile industries, paper and pulp production on a large scale. The increasing number of textile industries along with the development of new paper production plants have thus been having a significant impact on the product demand. The rising urbanization and industrialization has led to a large amount of wastewater being disposed in the atmosphere, that has had a negative effect on the aquatic and human life. Considering the surging emergence of waterborne diseases and adversely changing environmental conditions due to wastewater, regulators of the various countries have been investing in the development of water treatment plants, thereby augmenting the global bleaching agent market. Speaking along the same line, in North America, regional governments have been taking initiatives to construct water treatment plants across the continent. For instance, recently, the township of Wellington North in Canada received a fund of USD 5.75 million to upgrade its 30 years old wastewater treatment plant. The federal government, as well as the Federation of Canadian Municipalities, have supported the township to upgrade the Arthur Wastewater Treatment Plant. The concerns behind this initiative were the projected rise in the population and increase in sewage discharge. The local governments are thus becoming more aware of the need for wastewater treatment plants for maintaining the healthier climatic conditions. The significant involvement of regional governments in the implementation of township programs for fulfilling the needs of the rapidly increasing population in urban as well as rural areas is poised to have a positive influence on the bleaching agent market share. 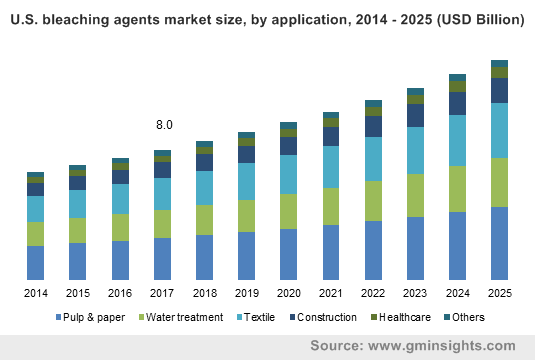 In fact, bleaching agent industry size from water treatment applications has been slated to register a CAGR of 5.5% over 2018-2025. Heavy investments in the plants associated with paper and pulp industries, considering the surging use of papers for packaging and printing applications have also been augmenting the product demand on a large scale. The textile sector is not far behind either, in contributing toward the growth of bleaching agent market. For the record, in 2017, textile industry accounted for a 22% share of bleaching agent industry. The preferable use of bleaching in various industrial processes comprising stabilization, detergency, wetting, lubrication, and sequestering have been propelling the industry trends over the last few years. Taking into account the innumerable business opportunities, players in the bleaching agent market have been expanding their facilities to increase the production capacity. Some of the companies have been acquiring rival businesses to gain a more competitive position. Validating the aforementioned fact, a few days before, in order to bolster its regional position in the peroxide-based bleaching agent market, the German chemicals manufacturer, Evonik signed an agreement to buy the U.S group PeroxyChem for USD 625 million. With the acquisition of this peroxide manufacturing facility, Evonik has been able to strengthen its portfolio of eco-friendly and high-growth specialty chemicals. All the legal formalities of this agreement will last till the middle of 2019, post which it is touted that Evonik would have considerably enhanced its position in the business. The surging demand for peroxide across the healthcare, textile, and paper and pulp industries have been encouraging numerous other players to invest in peroxide bleaching agent market. Aided by a widespread application spectrum, peroxide bleaching agent market will register a CAGR of more than 5.5% over 2018-2025. The expanse of this market has reached several geographies – say for example, in India, the Indian Peroxide Limited (IPL) has constructed a new hydrogen peroxide plant in Gujarat province. At the new manufacturing plant, the company is planning to produce eco-friendly and premium quality hydrogen peroxide. The company aims to cater to the surging product demand primarily across wastewater treatment, textile, healthcare, and paper & pulp industries. An upsurge in the product consumption across several economies is likely to generate lucrative opportunities for the market players over the years ahead. It is noteworthy to mention that propounding expansion of the aforementioned end-use sectors will also have a positive influence on the bleaching agent market outlook. The initiatives taken by the governments to improve the sewage systems for maintaining a healthy environment and the shifting focus of chemical manufacturers toward the development of customer-centric products are poised to propel the industry trends over the years ahead. For the record, the bleaching agent market is likely to generate revenue of more than USD 91 billion by the end of 2025.